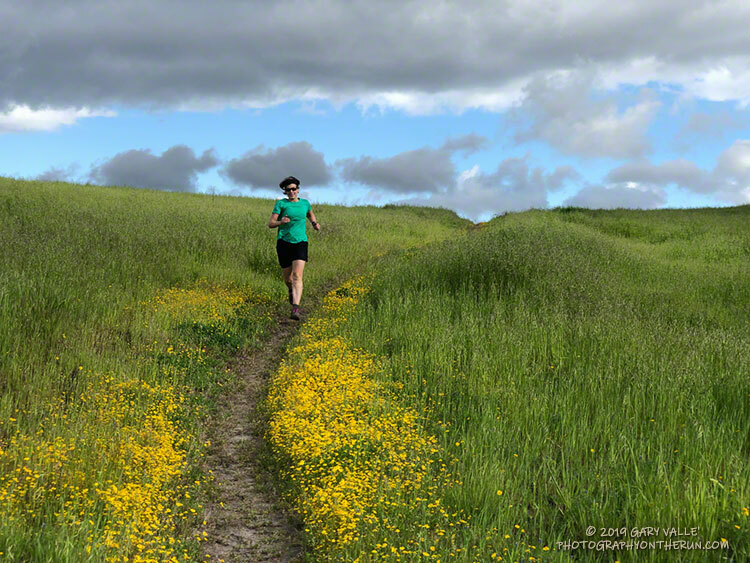 Photography on the Run - Images taken on trail runs, and other adventures, in the Open Space and Wilderness areas of California, and beyond. All content, including photography, is Copyright © 2006-2019 Gary Valle. All Rights Reserved. 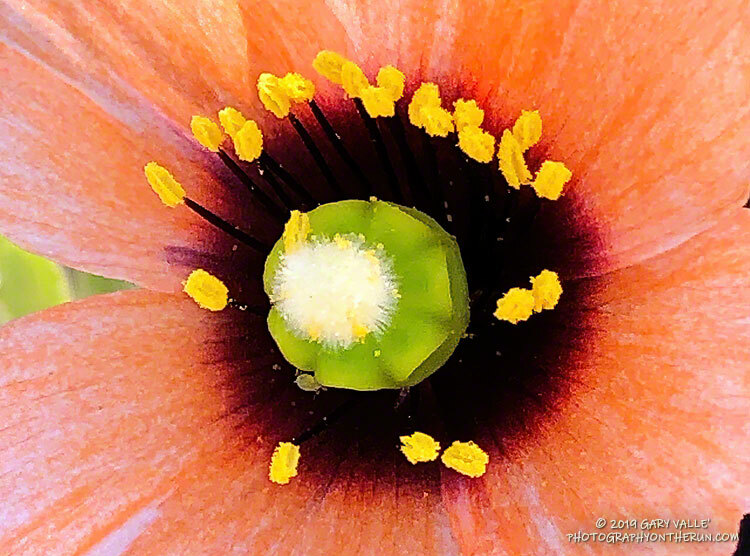 The wind poppy is one of several new wildflowers I’ve recently added to the slideshow in the post Weekday Wildflowers. Only about the diameter of a dime, the flower of this uncommon poppy is easy to miss. A closer view reveals its striking combination of form and color. Many of my weekday runs are on the trails of Upper Las Virgenes Canyon Open Space Preserve (formerly Ahmanson Ranch). In the wake of the Woolsey Fire and our wet rain year, the hills of Upper Las Virgenes Canyon Open Space Preserve have been covered with a dense carpet of green that has recently transitioned into a sea of mustard yellow. The grasses have now gone to seed and the hills will soon turn a summery-blond. At first glance, just about all you see at Ahmanson Ranch is the green and yellow. But if you look closer, intermixed with the black mustard and other introduced plants are a variety of wildflowers. In a few areas of the Preserve, there are large patches of native wildflowers, but it is more common for the native flowers to have to battle introduced plants for growing space. Some species are more successful than others. Here is a slideshow of the wildflowers I’ve been seeing on my weekday runs, along with some comments and the date the photo was taken. Some of my weekday runs extend into Cheeseboro Canyon, so wildflowers from that area are also included. Additional photos may be added as the season progresses. The yellow flowers along the trail on which Lynn is running are goldfields. As of April 10, there were still patches of goldfields blooming in the Lasky Mesa area. 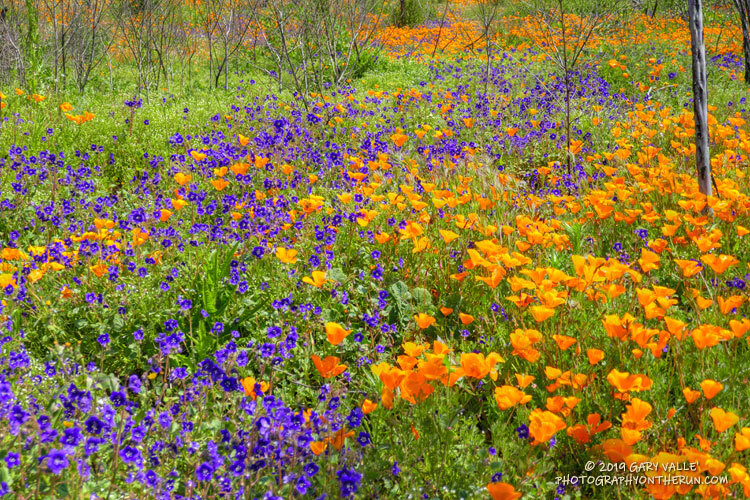 Parry’s Phacelia and California Poppy along the Old Boney Trail in Pt. Mugu State Park. From the post Wildflowers, a Waterfall, and Recovering from the Woolsey Fire. When I left the house to drive over to Ahmanson Ranch, the temperature in West Hills was 92 °F. It had been five months since it was that warm. It’s been my experience that the first hot weather of Spring is often associated with an uptick of snake sightings. Over the past seven days or so, I’d seen a very young rattlesnake and a couple of small gopher snakes, but so far, that was it. With the warm weather, I thought I might see a snake on my run today, I just didn’t expect it to be in this manner. Lost in thought, I was just about to the entrance of Upper Las Virgenes Canyon Open Space Preserve (aka Ahmanson Ranch) when I was startled by a large red-tailed hawk flying from right to left directly in front of me. Something long was dangling from its talons. 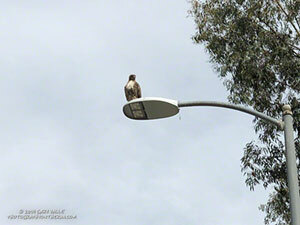 I stopped and watched as the raptor, fumbling with a large snake, awkwardly flew onto the top of a street light. The snake was dangling precariously from the light, and the bird seemed to be having a little trouble holding it. The snake looked relatively heavy-bodied, and at the time I thought it might be a rattlesnake. That brought to mind a story of a hawk somehow dropping a rattlesnake into a car. However improbable, I didn’t want to approach the hawk and frighten it. I have enough problems with rattlesnakes on the ground and don’t need them falling from the sky. I got what photos I could with my phone and headed out for a run. You know how it is when you’ve seen a snake — anything sinuous on the trail sets off the brain’s snake alert. During my run I saw a couple of stick snakes, but no real ones. Finishing my run, I pressed the Start/Stop button on my watch and started walking across the parking lot. Red-tailed hawk waiting to retrieve a dropped gopher snake. What? 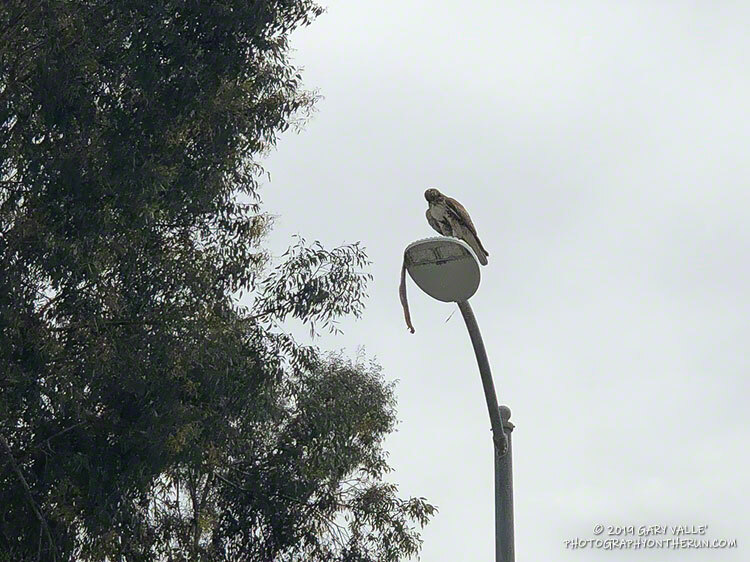 I squinted my eyes… Was the hawk still perched on the street light? No way, more than an hour had passed! Continuing across the parking lot, I could see the hawk was still there, but where was the snake? Cautiously, I approached the light post. I didn’t want to agitate the hawk or stumble onto an upset rattlesnake. Sometime during my run, the hawk had dropped the snake — a gopher snake — and was waiting to retrieve it. It lay upside down on the street — sans its head. Rattlesnake or not, the hawk had removed the dangerous bit first. I’ll be curious to see if the snake is still in the street tomorrow. Update April 11, 2019. The following day (Tuesday) no trace of the snake remained, but the red-tailed hawk was still there — perched on an adjacent street light. On Wednesday the bird was gone. The sun had not yet risen and the poppies along Danielson Road were still tightly furled against the morning’s chill. The purl of Upper Sycamore Creek resonated in the canyon below — a wonderful tone that in recent years has too often been squelched by drought. I was running to the Old Boney Trail and the start of the ridge that follows along Boney Mountain’s western escarpment to the massif’s huge summit plateau. Several of the Santa Monica Mountains highest peaks are on this plateau, including the range’s highest peak, Sandstone Peak. In December I’d climbed this route to check the impact of the Woolsey Fire on the area. From the top of the ridge I’d been disheartened by what I saw. Tri Peaks and Sandstone Peak and much of the top of the Boney Mountain massif were a blackened, barren mess. 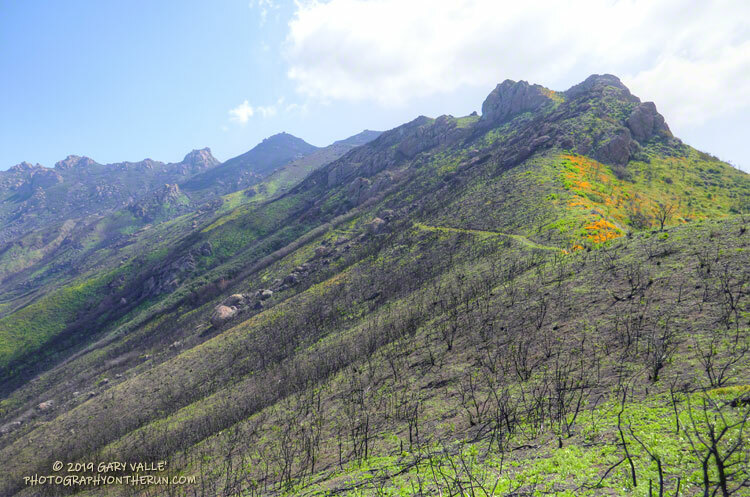 Now, three months later, I was headed back to Boney Mountain and would continue to Sandstone Peak for the first time since the fire. Parked in a turnout on Mulholland Hwy, I finished putting on sunscreen and then pushed the Start/Stop button on my watch to dial in the GPS and pair my HRM. Outside, it was a chilly 43 degrees. Sunrise was nearing and the strengthening March sun was forecast to push temps well into the 70s. 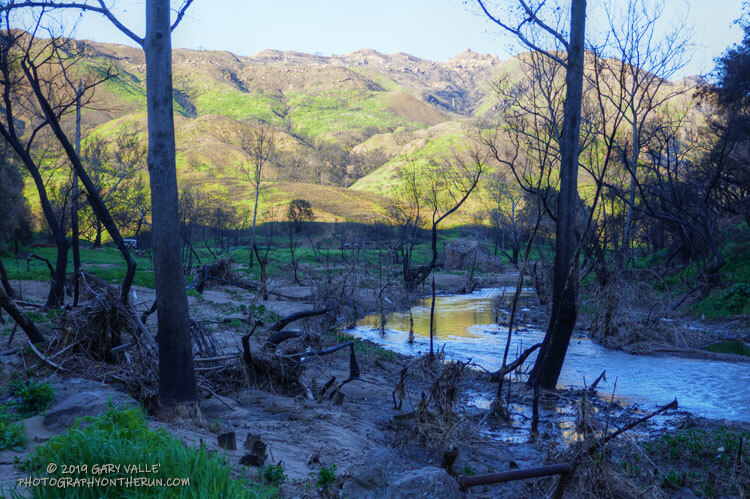 In the aftermath of Woolsey Fire, I’d returned to Malibu Creek State Park to see the wildflowers; gauge the response of the creek to heavy Winter rains; check on the health of the redwoods along the Forest Trail, and assess the ongoing recovery of the burned chaparral. Today’s run of the Bulldog Loop would be a follow-up to two runs in the park in December 2018, which found a fire-ravaged landscape just beginning the long process of recovery.